Your entryway landscape design is a visitor’s first impression and the key to ‘curb appeal’. When it comes to designing your entryway, start by establishing the principles, and the elements to be included in the project. Perhaps the most significant principle is that the design should reflect the architectural style of your home. The design program will determine how the space is used. Is it simply a transitional space to get to the front door or will the space be used for seating and gathering also? These are the choices in paving, lighting, plants and special features that create the built project. More than the aesthetic value that patios can provide, these outdoor living areas can also turn boring, cold nights into inspiring and relaxing moments and make warm, sunny days into hopeful and glorious ones. The patio is the best place to entertain guests who would certainly love the cool outdoor air and admire your lovely landscape. It’s also the ideal place for afternoon naps or playing with the kids. If you have a pool, it can double as a drying place for your visitors. With a patio, there’s also no need to worry about your signature furniture indoors. Patios Such a wonderful place can be yours if your patio is designed and built by experts like us. Our masons and carpenters have the required training and experience in building perfect patios. And, with our latest tools and equipment, how can you go wrong? Once you call us, our team will assess your Pennsylvania property outright. Several factors are taken into consideration during this stage, including the existing structures in your home and landscape. After the initial survey, we will then provide recommendations about the possible design and installation area of your patio. At Fox Landscape Designs, we do not limit your options. 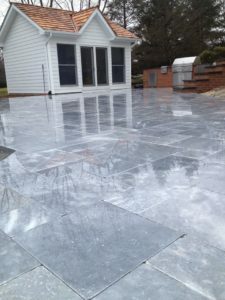 We can work on any type of material for your patios. You can choose from natural stones, bricks, and concrete pavers. If you want a more classic look, we can highlight the use of wood in building your patio.